These are photos of Skippy. It's been a week and a half since he died. Still hard for me. He was with me nearly every day for 11 years and was such a vibrant, active, protective, and smart dog. Good bye Skip, my friend. I miss you. 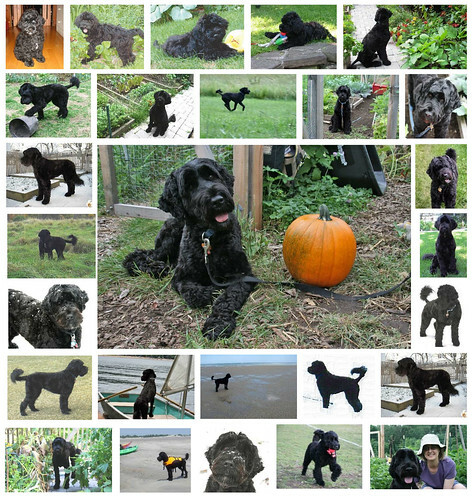 Skippy was a Portuguese water dog. He was bred by C-Lion PWDs in Bedford MA. His mom was Clio and his dad, Brisco. He was born the day before Easter in 2005. Skippy was my companion. He was an unruly pup and because of this we did a lot of training with him. Maybe his unruliness was because we were novices and he was our first dog, maybe it was his vibrant nature, or maybe he wanted to learn how to communicate with us. Maybe it was all of this. Whatever, we figured it out together. Skippy did over 50 hours as an excellent therapy dog with Caring Canines. He was an accomplished gardening dog with 11 years of experience (wink). He did a bit of agility work, loved swimming and boating, and loved his little buddy Suzie, who came to live with us when Skippy was 8. He taught Suzie all sorts of things, most of which were good things. Skippy was a great protector and vigorously protected me and my gardens. He could run like the wind, down sledding hills, across open fields, after Suzie, and down the beach. He was healthy his entire life, never sick a day. On August 26, when he was 11 years old, he died suddenly from a burst spleen tumor, going into cardiac arrest before they could get him into surgery. I think he had a great life, I certainly enjoyed being with him. I will remember him always. Thanks very much to all who have sent their condolences. Oh I am so sorry for your loss of Skippy. He was such a cute boy. The loss of our dog companions is so hard, but the memories will stay with you forever. Thanks. I was lucky to have him. Kathy - I check up on your blog often and was heartbroken to read about Skippy. I am so sorry for your loss. As my wife said when we lost two of our long time feline companions last year within a few months of each other - "this is the price we pay for loving them so" - but I feel that they give us so much, it is worth it all. What a nice selection of photos. He looks both cute and elegant at the same time! It sounds like he had quite a good life with you. Yes, cute, elegant, and believe it or not, very protective of me and Suzie. He could be intimidating with his strong bark and deep growl. So sorry for your lost. He was a good life with your care. I'm so sorry about Skippy, he certainly was a handsome boy. He must have felt so important in his roll as garden dog and protector. It's been a while since Chorizo and I have looked at your blog. I'm so sorry to hear of Skippy's passing. Are thoughts and tears go out to you and your other PWD. Ah, I had heard that he was gone from AVB. I'm sorry, Kathy. Not being a dog person, I'm sure there is a version of grief special with dogs. Having lost beloved cats, though, long-time companions and newly minted kittens both, I understand something of the pain. Long live his lively memory! !